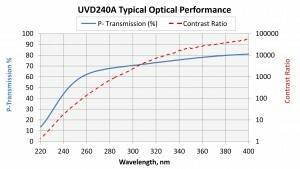 The Moxtek® Proflux® UVD260 and UVD240 analyzers provide superior broadband performance in spectroscopy applications ranging from 240nm in the Deep UV up to 3.3μm in the mid-wavelength infrared. Moxtek Proflux designs utilize wafer-scale aluminum Nanowire® fabrication technology to produce the finest-pitch commercial wire grid polarizers on the market. These deeply sub-wavelength optics offer the benefits of conserved space, an exceptionally wide field acceptance angle, minimal performance variation with wavelength, and none of the dramatic short-wavelength infrared disturbances present in Glan-Taylor and Glan-Thompson polarizers. 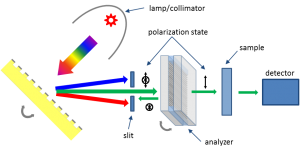 Figure 1: Simplified spectrophotometer with analyzer. Figure 1, depicts the light path for a simplified spectrophotometer with polarizing analyzer. This type of arrangement is useful when examining dichroic and birefringent samples, diffraction gratings, or when characterizing samples in reflectance. Typical polarizers used in this analyzer application are based on the Glan-Taylor (GT) or Glan-Thompson (GTh) designs, which generally utilize Calcite prisms. Unfortunately, inherent absorption in calcite and scattering from inclusions and impurities can severely limit UV transmittance and achievable signal to noise ratio in GT and GTh designs. The ProFlux UVD Series polarizers by Moxtek offer an alternative with dramatically improved deep UV transparency for better signal to noise ratio performance. 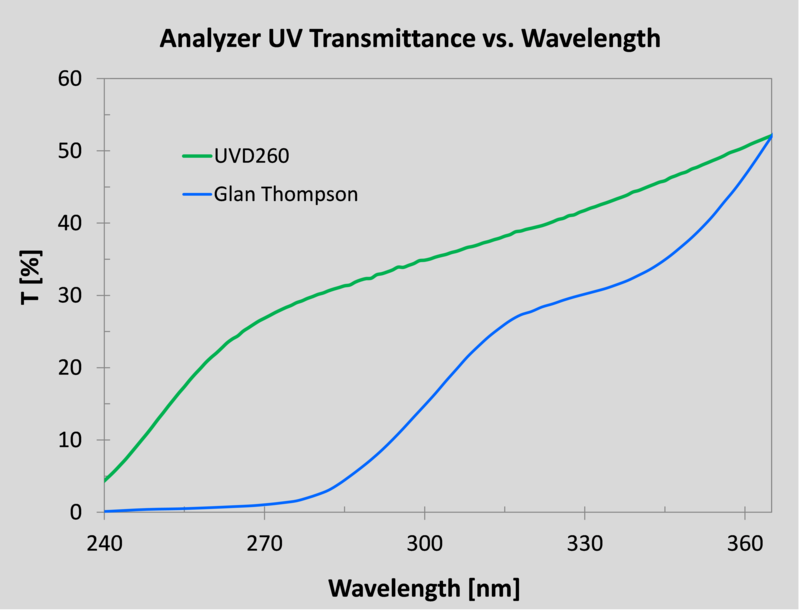 Figure 2a compares the UV passing state transmittance for a standard calcite GTh analyzer and the Moxtek UVD260, while figure 2b compares their performance when measuring the blocking state transmittance of a reference polarizer. 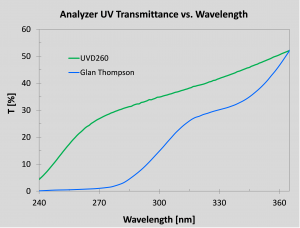 The GTh analyzer shows a dramatic reduction in UV light throughput resulting in a poor signal to noise ratio, while the UVD260 is fabricated on fused silica and maintains excellent performance well into the deep UV. 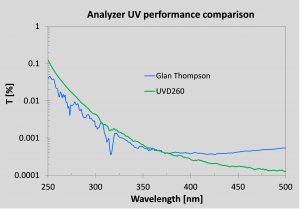 Figure 2b: Performance comparison of ProFlux UVD260 and Glan-Thompson polarizers in an analyzer application. Reference part measurement. The Glan-Taylor (GT) and Glan-Thompson (GTh) polarizer designs consist of two birefringent prisms mounted with their diagonal faces either separated with a small air gap (GT), or filled with an optical cement (GTh). The separation of an incoming beam into orthogonal polarization states relies on total internal reflection and thus imparts strict requirements on beam collimation and entrance angle. Since refractive index generally decreases in the infrared, this results in a decrease in the allowed deviation from normal incidence for the GT and GTh polarizer designs. For spectroscopic applications, where beam collimation is usually far from ideal, this results in significant leakage of the unwanted polarization state. While the GT and GTh polarizer designs can typically only tolerate a few degrees of entrance angle misalignment or a narrow field (cone) angle before performance deteriorates, wire grid polarizer performance is relatively angle and wavelength insensitive and shows practically no IR leakage of the unwanted polarization state. The ProFlux UVD designs can easily accommodate ±20 degree variations from normal incidence with minimal performance variation. This corresponds to a field angle of 40 degrees, which allows for dramatically improved light utilization when using poorly collimated sources and eases any alignment concerns. 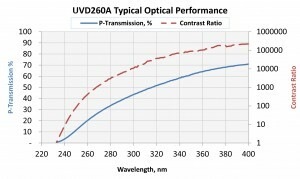 Figure 3a depicts the dramatic difference in infrared performance between a GTh polarizer and the ProFlux UVD260 when analyzing the same part (another UVD260). In addition to the increased leakage at longer wavelengths due to the limited field of view of the GTh design (see inset), there are strong peaks, likely due to IR absorption resonances from calcite and impurities (e.g. moisture). The Kramer-Kronig relationship dictates that any absorption resonance is also accompanied by an incongruity in the index of refraction, which should manifest itself in the field acceptance angle. 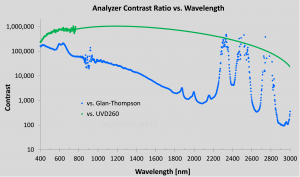 By comparison, the UVD260 analyzer shows no such infrared leakage or resonance peaks due to its sub-wavelength grating design and fused silica substrate. 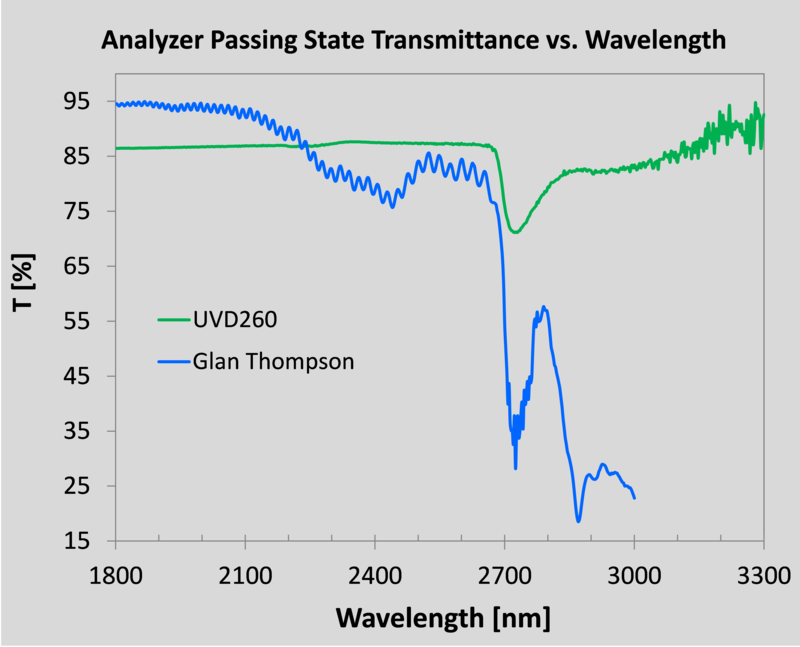 The transmittance of the GTh and UVD260 polarizers in the passing state are depicted in Figure 3b. The same absorption features responsible for the IR leakage peaks in the GTh blocking state measurement are also apparent here in the passing state. The moisture absorption line at ~2725 nm is much stronger in the hygroscopic calcite material of the GTh than in the UVD260, which is composed of aluminum and infrared grade fused silica. For enhanced short-wavelength infrared throughput and signal to noise, the UVD260 is clearly superior. 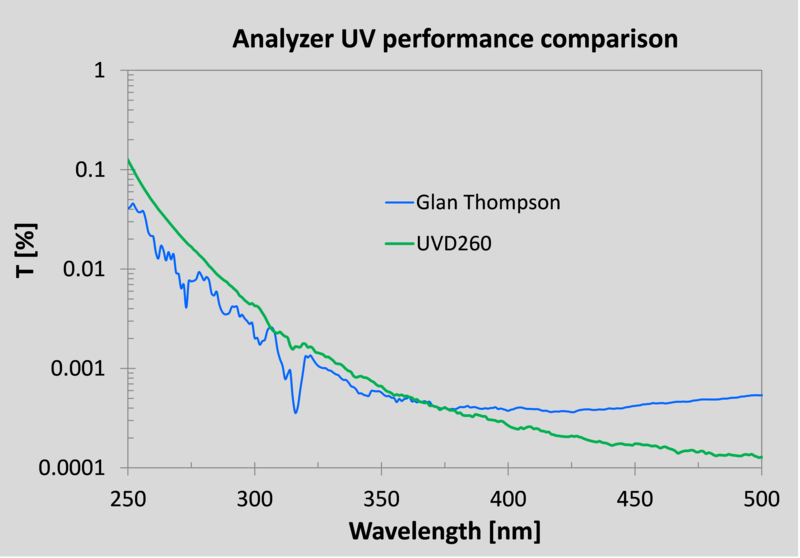 Figure 3a: Infrared performance comparison of UVD260 and calcite Glan-Thompson analyzers. 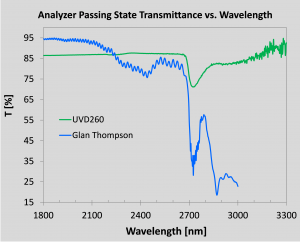 Blocking state transmittance measurements of the same reference polarizer using GTh (—-) and UVD260 (—-) analyzers. Inset shows magnified scale away from absorption resonances. 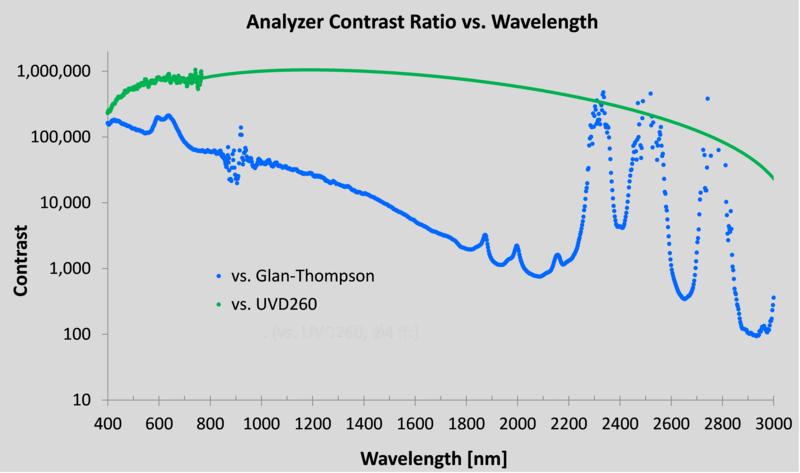 Figure 3b: Infrared performance comparison of UVD260 and calcite Glan-Thompson analyzers. Blocking state transmittance measurements of the same reference polarizer using GTh (—-) and UVD260 (—-) analyzers. Inset shows magnified scale away from absorption resonances. 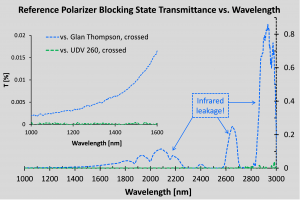 Figure 4 depicts the contrast ratio between passing and blocking state transmittances (inverse of extinction ratio) for UVD260 and GTh polarizers. The GTh infrared leakage has a dramatic effect on the contrast, thus the wire grid design is preferred for demanding IR spectroscopic applications. 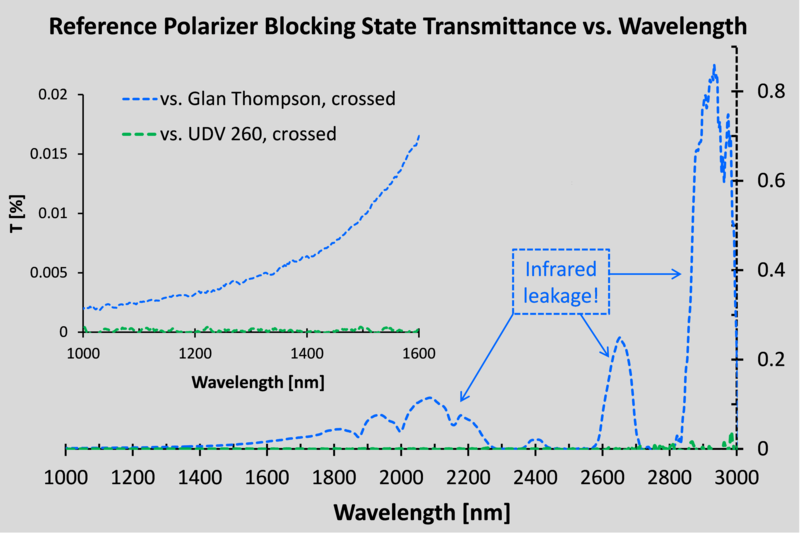 Figure 4: Contrast ratio between passing and blocking state transmittances for ProFlux UVD260 (—) and Glan-Thompson (—) polarizers. The UVD260 utilizes similar materials to Moxtek’s standard visible spectrum wire grid polarizer products, which are recognized for their excellent sustained performance in high temperature and high humidity projection display applications. Furthermore, the buried nanowire design of the UVD series helps protect against handling damage and environmental contamination. Whereas the infrared performance of calcite GT and GTh polarizers can noticeably degrade with time due to moisture uptake, the UVD Series wire grid polarizers are fabricated on non-hygroscopic fused silica and do not show significant performance degradation in humid environments. Due to the total internal reflection operating principal and large critical angle, GT and GTh polarizers have large aspect ratios between their length and clear aperture dimension. As aperture size increases, this aspect ratio requirement ensures the prism-based designs take up much more space in an optical system than the planar wire grid polarizer configuration, which has a fixed thickness (usually 2.1 mm) set by the substrate choice and spacer thickness. For the UVD series wire grid polarizers, the physical space required along the beam propagation direction remains fixed, regardless of the choice of aperture size. As a side effect, for larger aperture size GT and GTh designs, the length of the prisms also increases, which degrades performance in the UV and short-wave IR regions due to absorption and scattering. ProFlux UVD Series polarizers are capable of covering the entire spectral range of most spectrometers from deep UV through shortwave IR using the same part and without having to discard light from the larger field angles required when utilizing finite-sized broadband light sources. For GT and GTh polarizer designs, in order to dump the internally reflected beam, the prism sides have either an absorptive coating or are highly polished and housed in an absorptive case. However Fresnel reflections can still occur, leading to leakage of the unwanted polarization state through the exit face of the polarizer. ProFlux UVD Series polarizers separate the beams at the wire grid surface by an anisotropic absorption and reflection mechanism, and do not rely on birefringence and total internal reflection. This eliminates the long optical path length and absorptive surface/casing requirements inherent in GT and GTh products as well as the unwanted IR performance variation with wavelength. Table 1 summarizes the design, form factor and environmental differences between wire grid and Glan-prism based designs. When compared to Glan-Taylor and Glan-Thompson designs, the ProFlux UVD Series polarizers provide superior broadband performance for polarization sensitive spectroscopic applications. The aluminum Nanowire grid design on fused silica substrate is deeply sub-wavelength, providing excellent contrast and outstanding passing state transmission with minimal performance variation from the UV to the short-wave IR. The wide acceptance angle and space-saving form factor improve performance and efficiency while easing system design. See Figure 5 below for typical broadband performance plots. 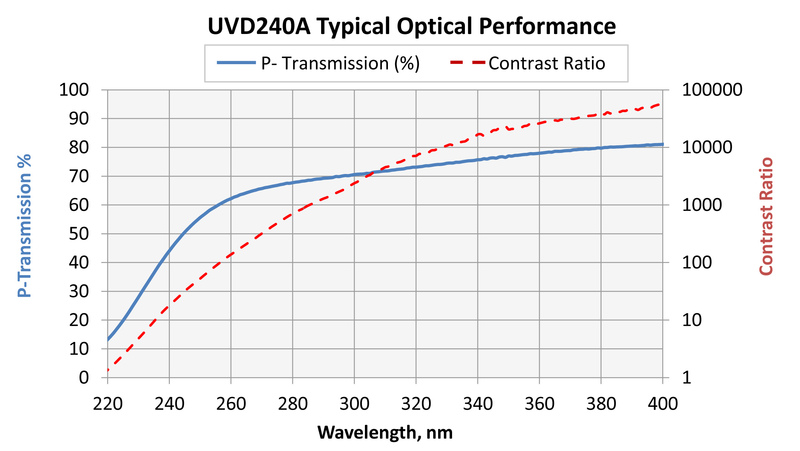 Figure 5a: Typical ProFlux UVD 240 series broadband performance plots for passing state transmittance (Tp) and contrast ratio (passing state / blocking state transmittance). 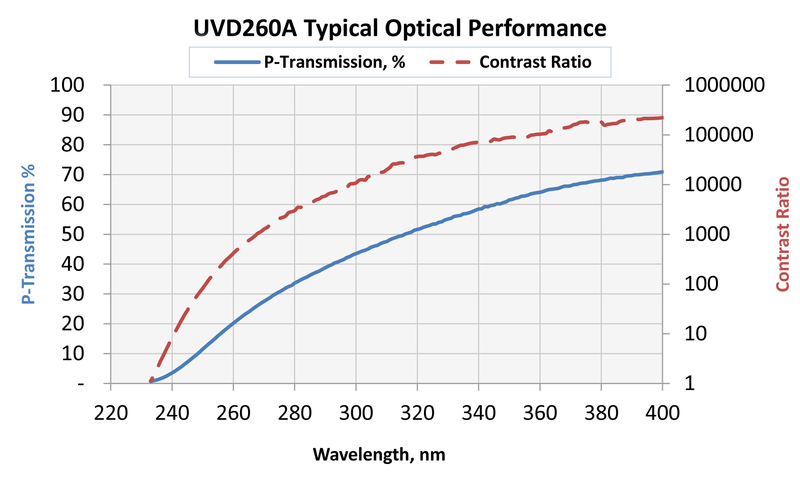 Figure 5b: Typical ProFlux UVD 260 series broadband performance plots for passing state transmittance (Tp) and contrast ratio (passing state / blocking state transmittance).